Karen grew up on the South Side of Chicago and moved to Hawaii (via San Francisco for 3 years) in 1979. While getting a degree in Music Performance from the University of Hawaii she was introduced to the theatre when she was asked to compose and perform the music for a university production. She later toured with the show, Song for A Nisei Fisherman, by Philip Kan Gotanda, on Kauai, Maui and the Big Island with a Kumu Kahua production. Painting as a specialty began with an apprenticeship with Tempe Denzer (Royal Academy of London trained artist, and former Hawaii Opera Theatre scenic). 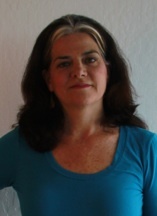 She began scene painting in the 90’s and attended summer training at Cobalt Studios in White Lake, New York in 1997. In the mid nineties she fell into designing sets for a small Windward Oahu theatre, and has continued to grow and refine her design and painting abilities through work in local television, commercials and theatre. Since 1999 she has been building, designing and painting sets for Hawai’i Public Television, Oceanic Time Warner Cable, Manoa Valley Theatre, Hawaii Pacific University Theatre and others, as well as freelancing in prop making and scenic work in TV and movies. Karen began working as a referral with IATSE local 665 in the mid -nineties, and became a full member in 2007. She was fortunate to work under Lead Painter Chris Barnes for 5 years and paint sets for LOST, and ABC’s, Off the Map, The River (paint foreman) and Last Resort. In 2008 she was the Hawaii scenic on Julie Taymor’s film, The Tempest (2010). Karen also acted as Theatre Manager at Hawaii Pacific Univerity, in Kaneohe, (June 2005, - Jan. 2011) where she produced two shows a year with Director Joyce Maltby. Currently residing in Chicago (though still based in Hawai’i & can work there). Available for custom projects, including murals, faux painting, and other specialty painting.